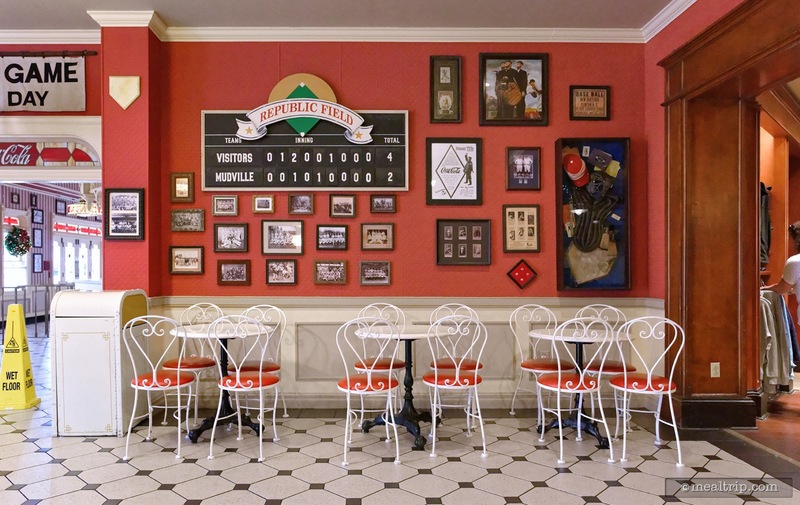 Here are 30 of the newest photos that have been uploaded to the Mealtrip directory. 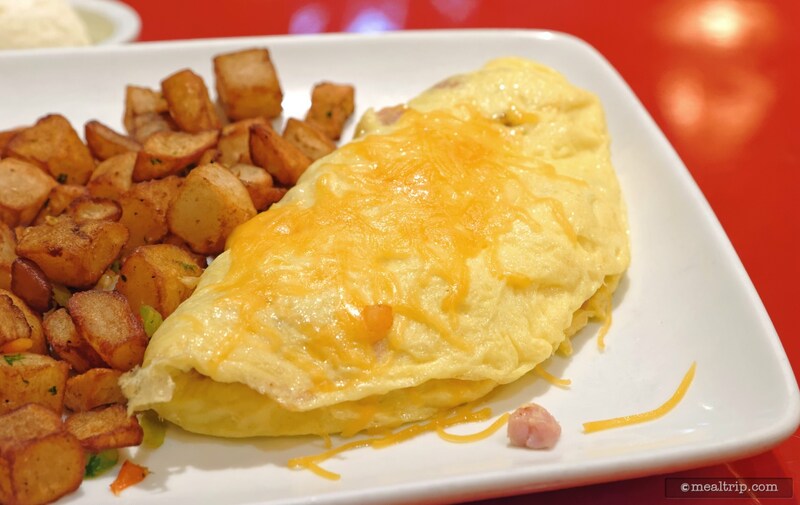 Click the image to view larger or click on the text to visit our review and photo page for that location. 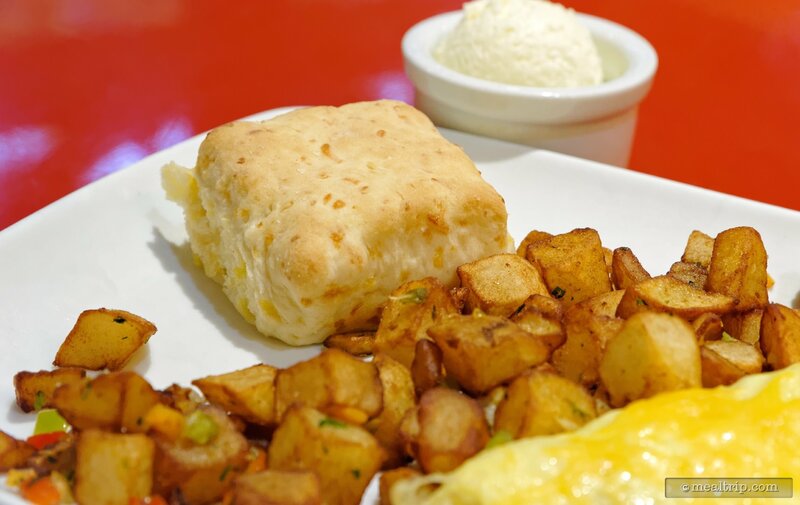 The House-made Buttermilk Cheddar Biscuit is served with a couple of the breakfast plates at the Whispering Canyon Cafe. It is surprisingly light. The whipped "butter" in the background, was really more like margarine. 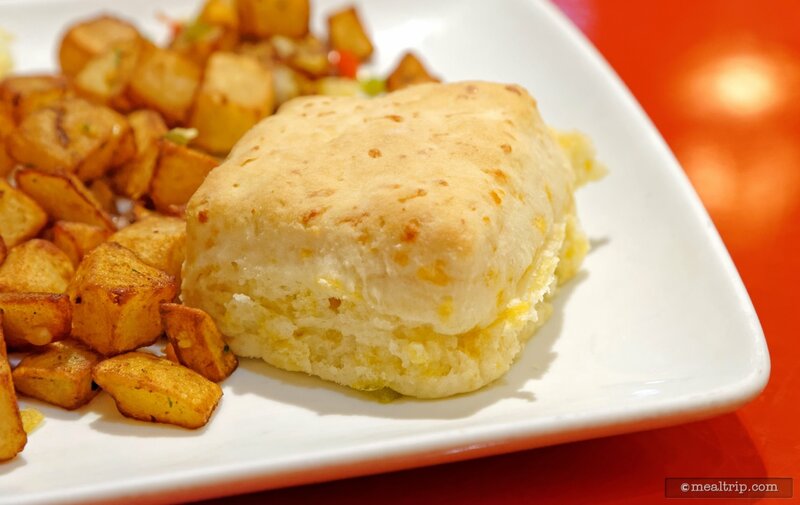 A House-made Buttermilk Cheddar Biscuit at Whispering Canyon Cafe. 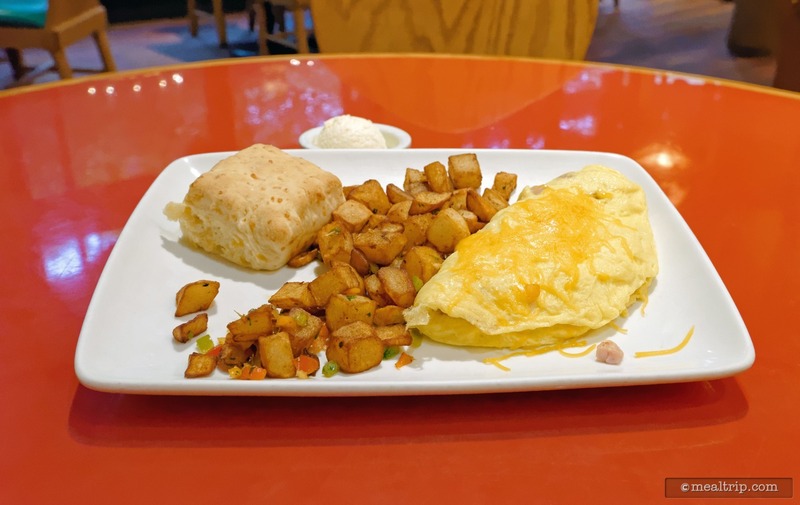 The Ham and Cheddar Omelette at Whispering Canyon Cafe. 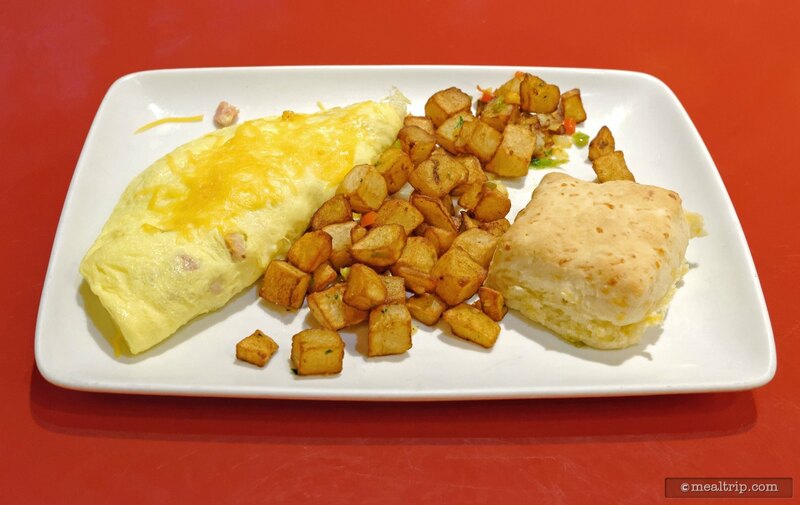 Ham and Cheddar Omelette which is served with Country Potatoes and a House-made Buttermilk Cheddar Biscuit. 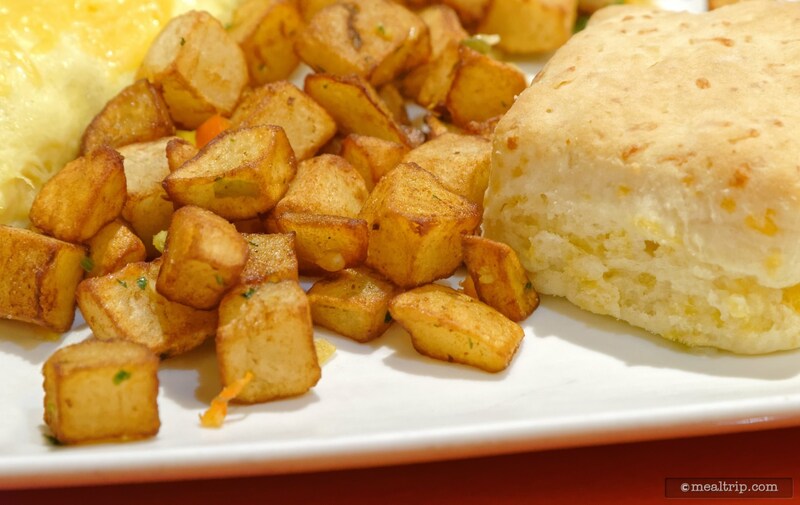 The Country Potatoes are a "side item" for a couple of the entrees on the breakfast menu. 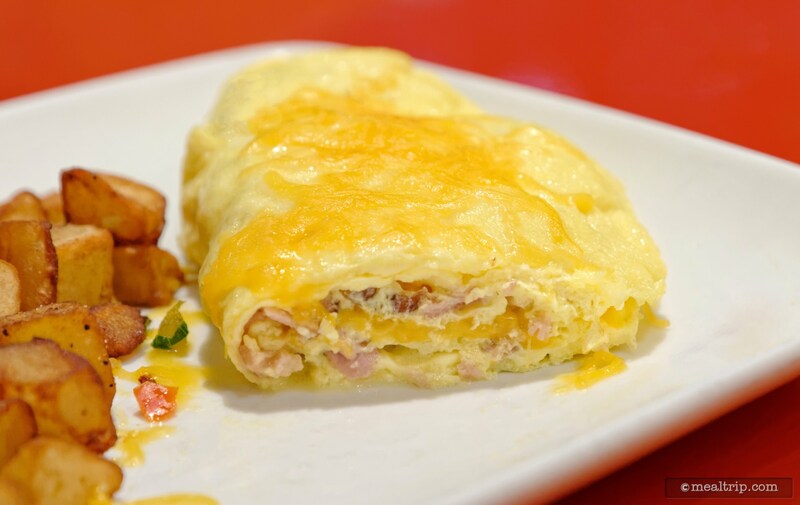 Once you cut into the Ham and Cheddar Omelette, you can see where they put the ham! 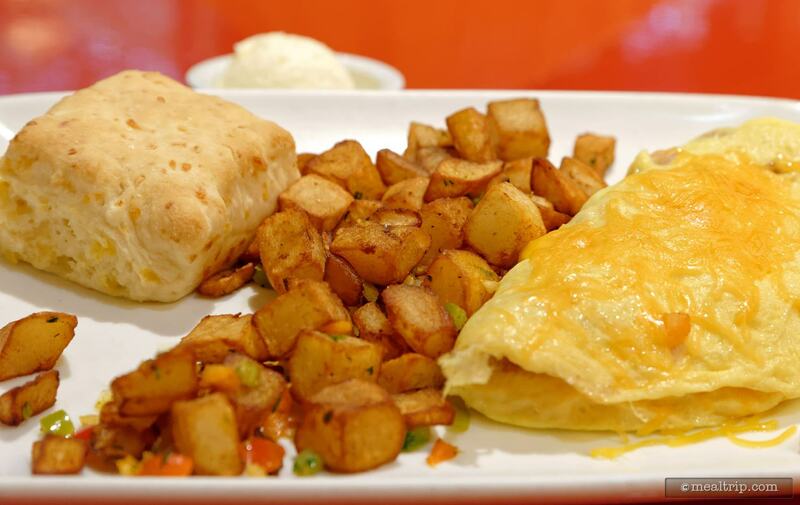 There is about equal amounts of cheese on top as there is on the inside. Those Country Potatoes were so tasty and aromatic. They had small bits of pepper, garlic, onion and a dried herb tossed in the mix. At 7:30am, the Cafe is pretty empty and quiet. 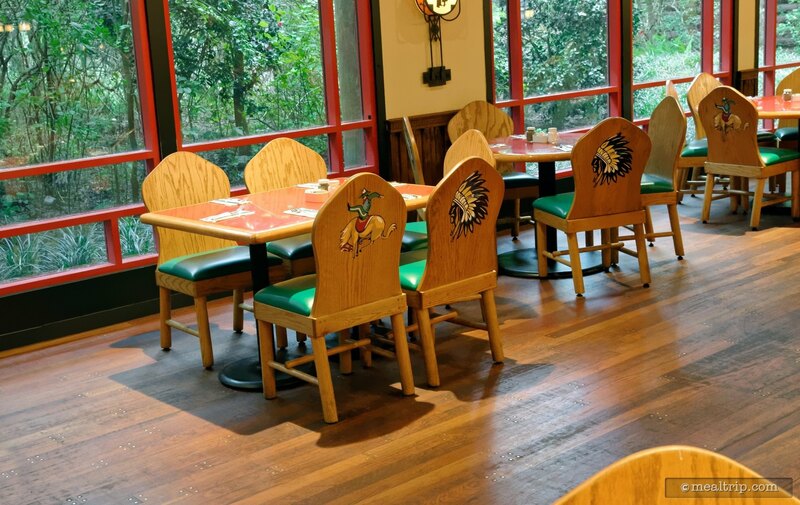 It stayed like this for the hour that I was there, but I think by 9am, the "show" antics that Whispering Canyon Cafe is known for, kick in. 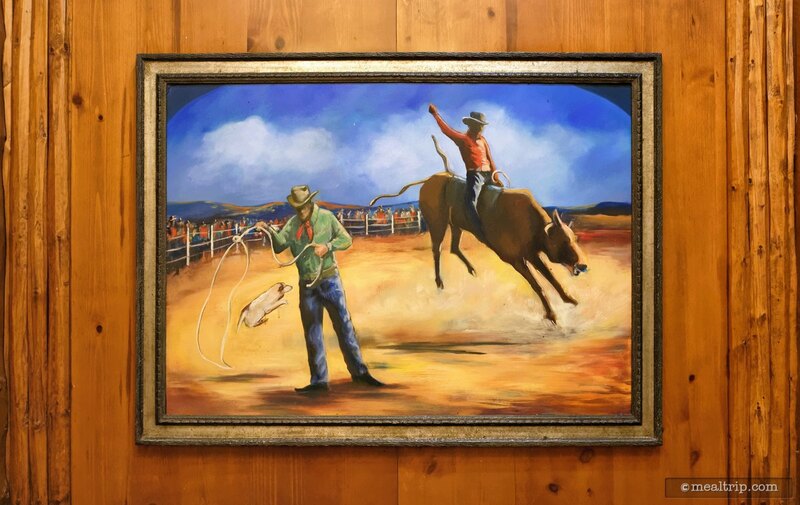 There are great design elements like this oil painting hanging on the walls of the main dining area. 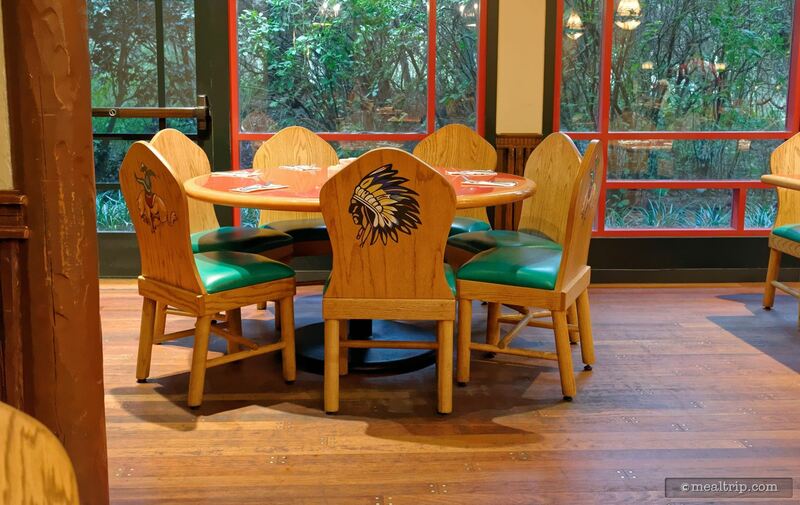 There are some larger tables at Whispering Canyon Cafe. This table is set for seven guests. 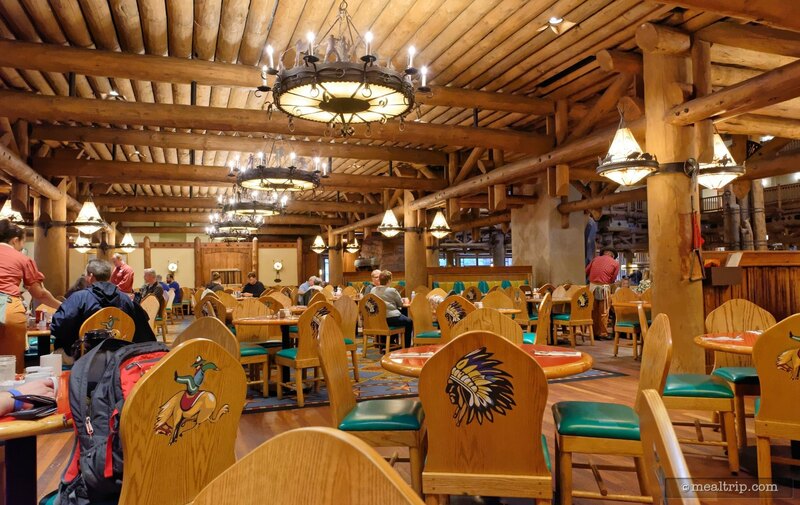 Most of the dining at Whispering Canyon Cafe is table and chair based (i.e. there are a few booths here, but not many). This is a table setting for four guests. 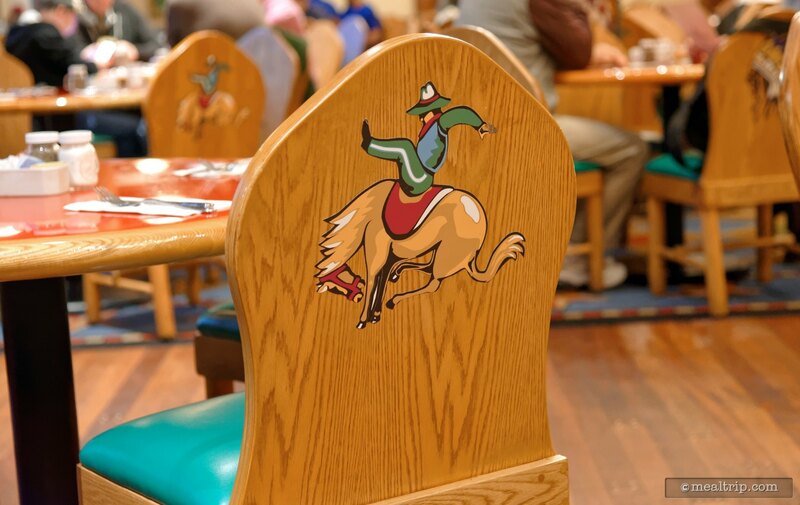 The decor at Whispering Canyon Cafe takes a fun, childhood, playful look at Western living and rodeo themes. In this photo, the "food ordering and pickup area" is on the left-hand side, while on the right, you can see part of the connecting gift shop. There's a lot of seating right outside Casey's, and as an added bonus... there's usually a ragtime piano player adding to the turn-of-the-century feel of this iconic Main Street location. 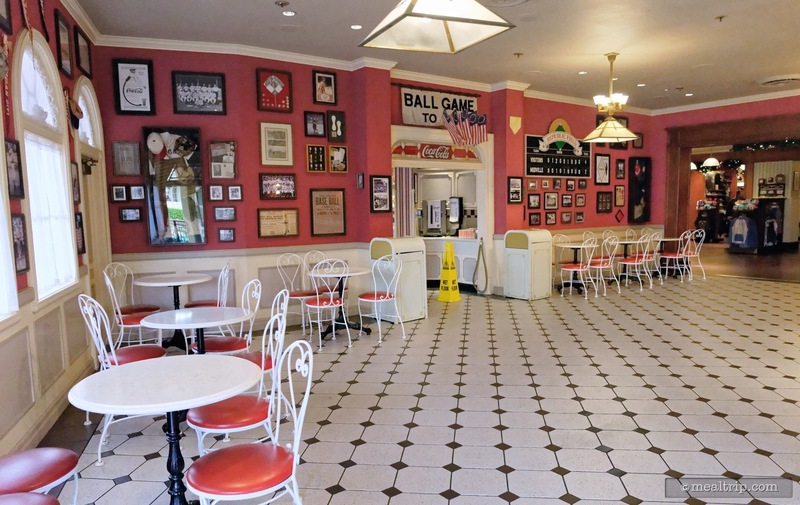 The interior dining area at Casey's is pretty small and is mostly "open floor". 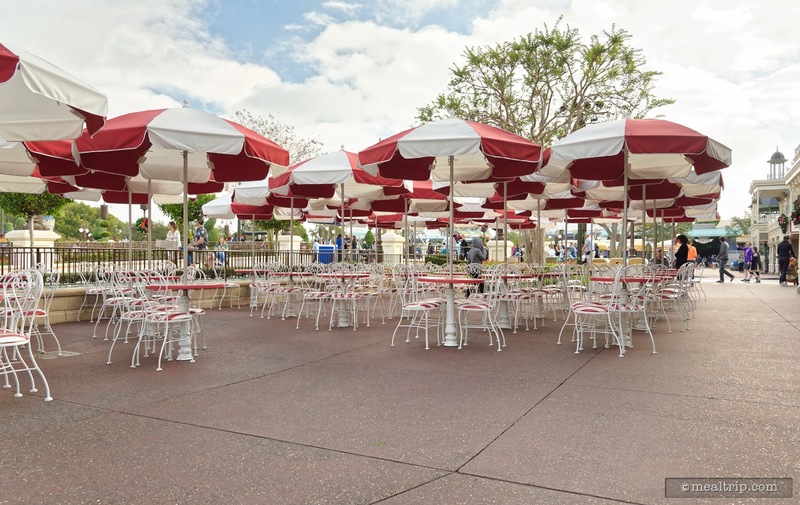 It may look like wasted space now, but this area gets filled up with guests once Casey's opens. 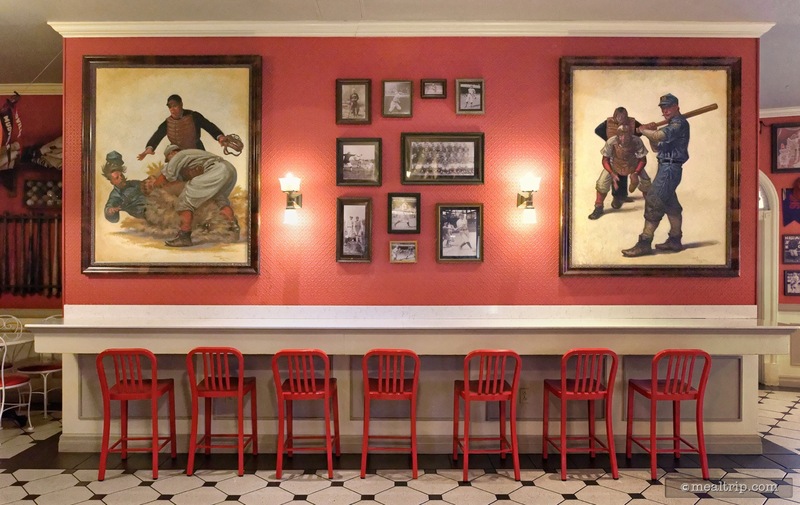 These seven dining spots don't offer much of a view, unless you really like looking at red wallpaper very closely — but, it is a seat and a table. 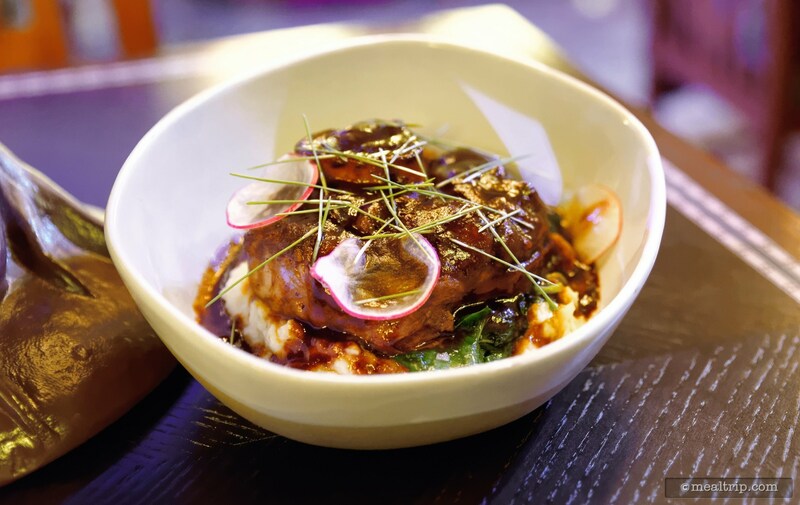 The Slow-braised Veal Shank was the highlight of my meal at Storybook Dining. It was a legitimately great entrée. 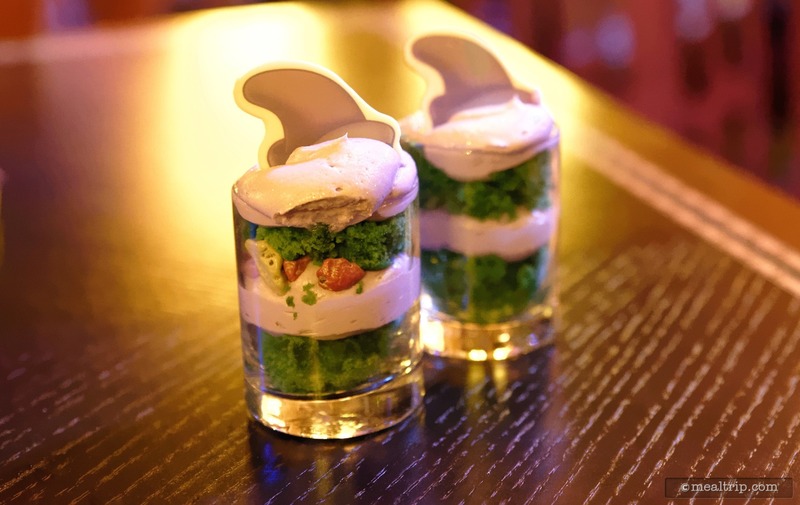 I'm still not crazy about the plating here (i.e. "wilted greens" should never be placed under mashed potatoes)... but the roasted bone marrow in the center of the shank was a real treat. 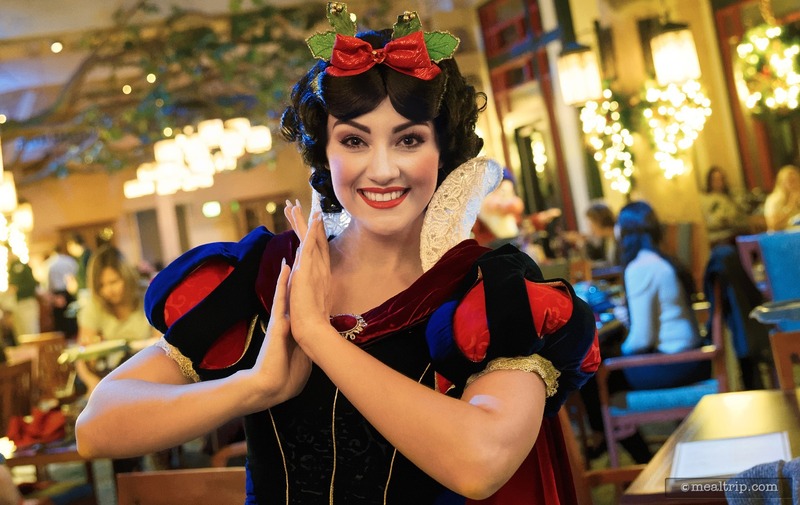 Snow White at Artist Point's Storybook Dining. There's not really any mention on the menu about the marshmallow fluff on a stick with a couple whole grain seeds stuck on it. Oh wait... that's the Caramel Lollipop with Granola? 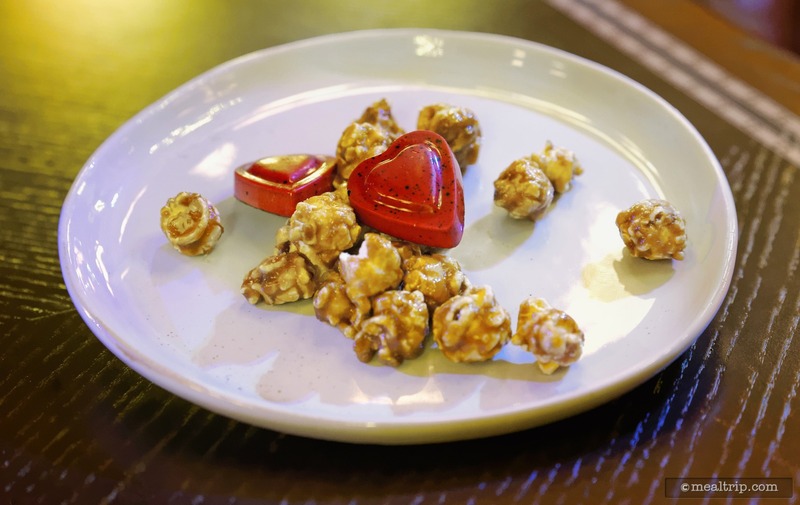 After the longest minute, all of the popcorn has been pulled out of that little box and placed on another plate so everyone at the table can enjoy this feast of popcorn. 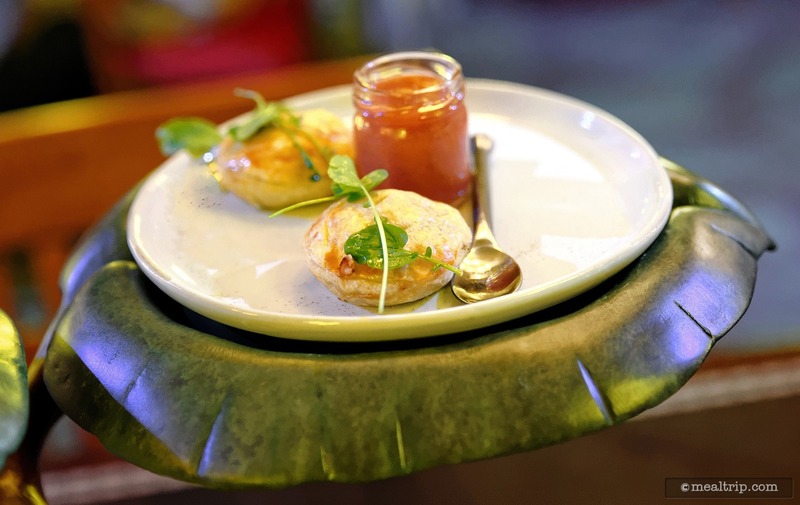 The Hunter's Pie (one per person) is a pastry shell filled with chicken. There's a very small jar of fruit preserves on the plate and a decorative green on each pie. 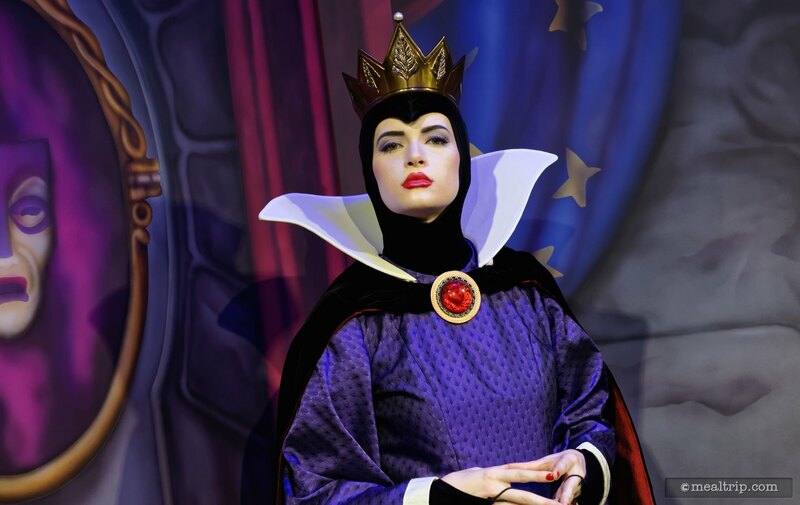 The Evil Queen has her own backdrop at Artist Point's Storybook Dining. 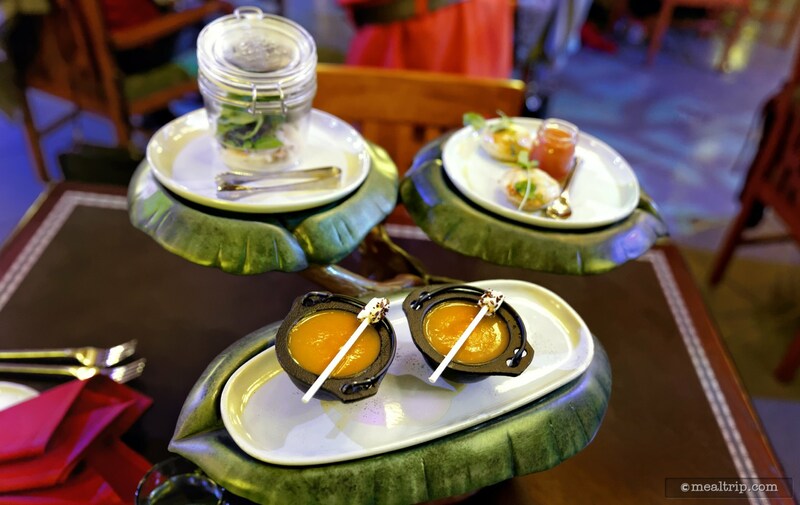 The trio of appetizers at Storybook Dining. Each guest at the table gets one shrimp, one chicken stuffed pastry nugget, and one min-bowl of soup. 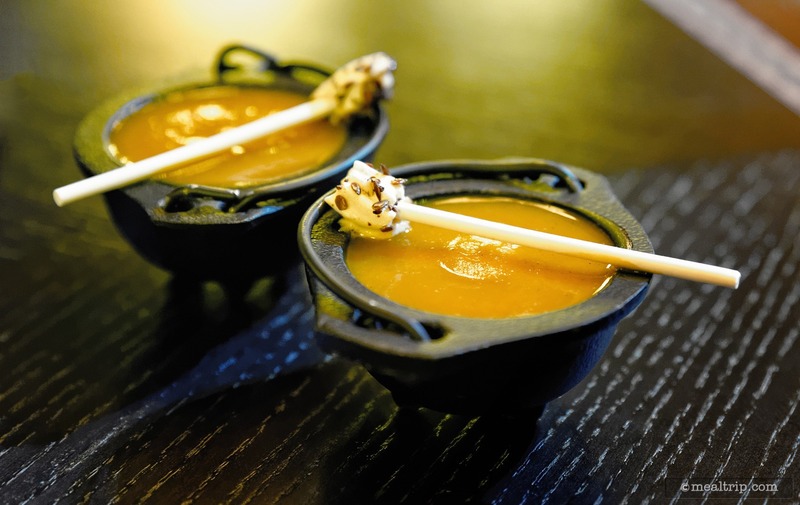 The little pot of WInter Squash Bisque is about four tablespoons large and is said to come with a Caramel Lollipop and Granola. All of the table's Wicked Shrimp Cocktail(s) (i.e. 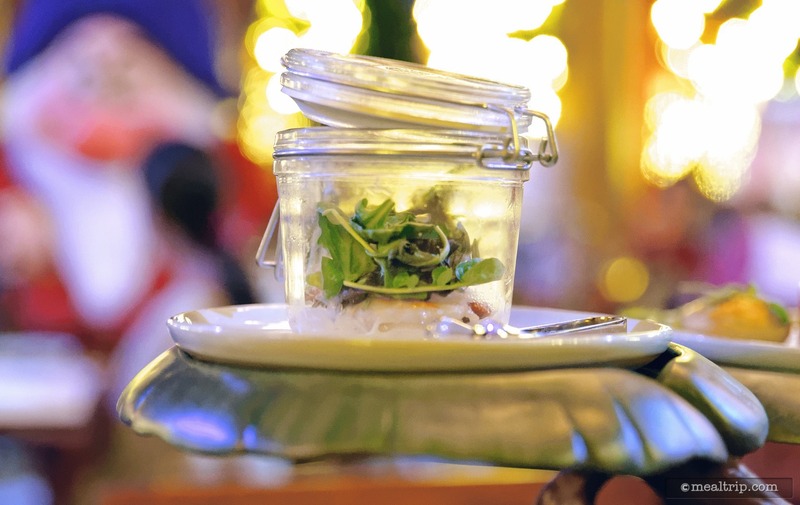 one shrimp per person) are housed in a plastic mason jar. 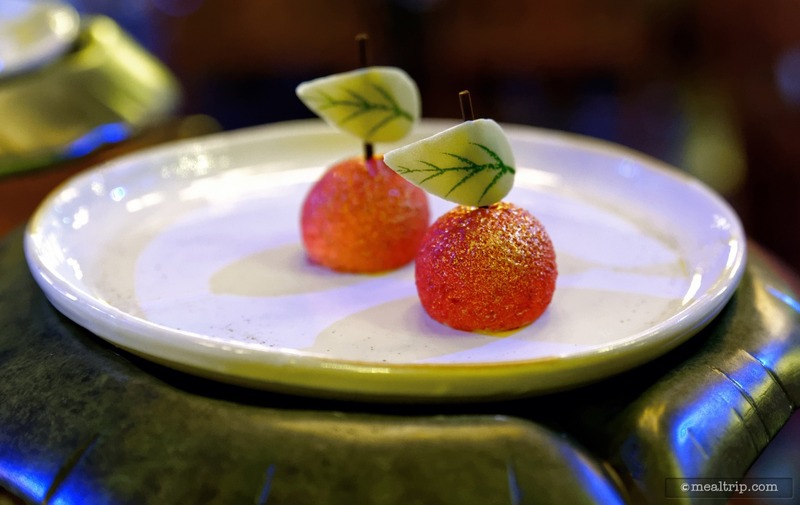 The "Poison" Apple is a white chocolate apple mousse with a sour center. 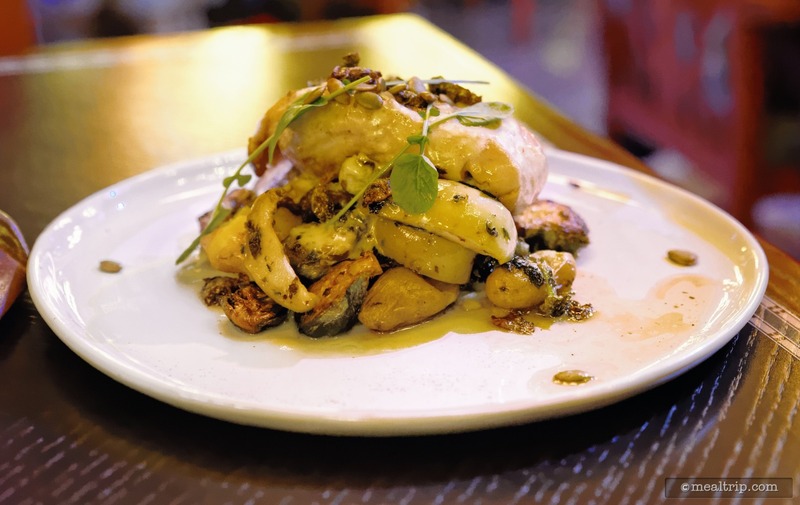 Mass protein piles are becoming more and more popular I guess... pictured here is a pile of bone-in chicken, potatoes, brussels sprouts, apples, and chestnut butter. 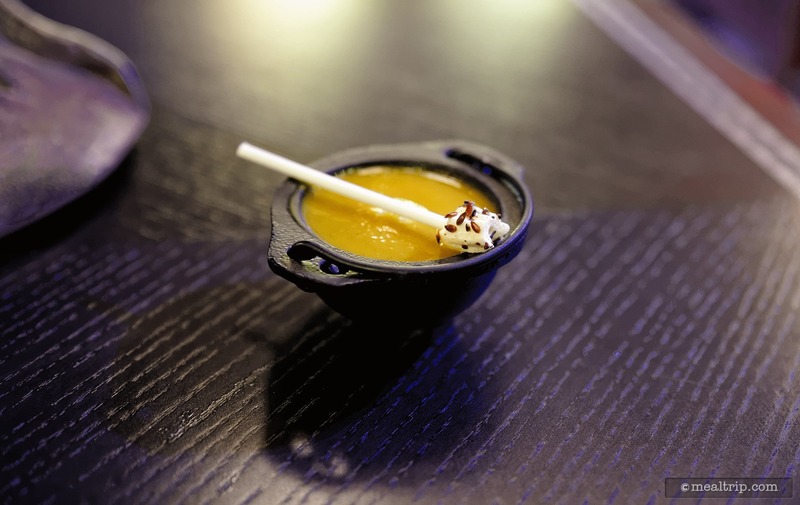 The Miner's Treasure is a small glass filled with sponge cake, chocolate gems, and buttercream icing. 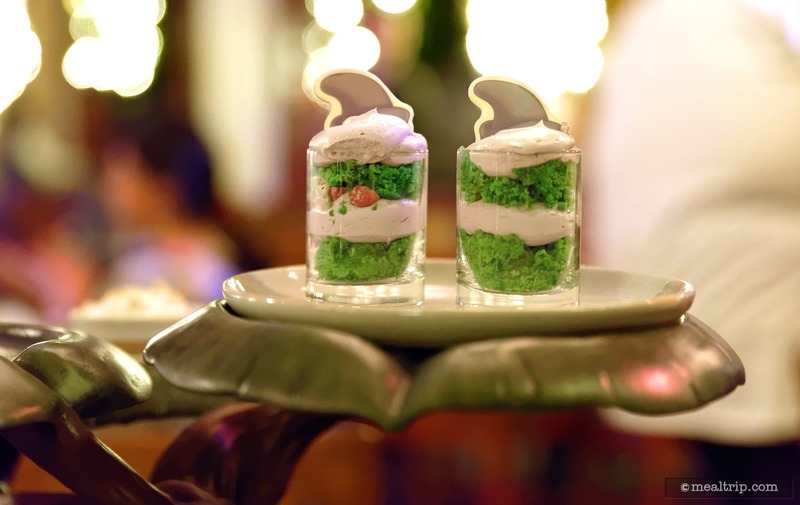 Sponge cake, choclate gems, and buttercream icing from the dessert plate at Storybook Dining.